Heavenly Sword developer Ninja Theory hopes to sell more copies of its new game, Enslaved, by offering up a number of different pre-order bonuses. Enslaved - Namco and Ninja Theory's take on the classic Chinese novel Journey to the West - is hitting stores shelves in just over a month. In an effort to get a few more eyes looking at its work, the publisher has put forward a huge advertising blitz, showing off trailers on YouTube, offering up special downloads, and setting up a bunch of special pre-order incentives for American and European gamers. Until the end of today (presumably in the Pacific time zone), anybody who pre-orders Enslaved through a special portal page will receive an exclusive comic book and a shirt featuring the silhouette of the protagonist, Monkey. The retail chain is also holding an Enslaved giveaway, offering up a number of nice prizes. One lucky winner will receive a "dream home entertainment system," containing a 55" television, a PS3 or Xbox 360, and an Enslaved statue. Four runner-up contestants will be given a copy of the game and the statue. Interested customers that miss the midnight deadline can still preorder the game from Amazon at any time for a free copy of the game's soundtrack. European gamers that want their own nifty pre-order bonuses have a ton of options - HMV customers will recieve a copy of the game's soundtrack and a book, while GAME pre-orderers will get the comic book and an exclusive in-game costume for Monkey. Play and Amazon will also be offering special in-game costumes. Irish gamers can stop by their local Gamestop stores for an exclusive hard-cover art book. 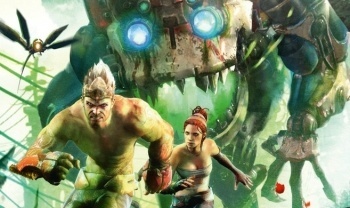 Enslaved: Odyssey to the West will hit the Xbox 360 and PlayStation 3 in the US on October 5th, with a European release landing just a few days later on October 8th.